Many cat owners feed cat food once or twice a day, and leave dry food for nibbling all day long. It can be hard to tell who’s eating and how much. Therefore, it’s important to keep an eye out for signs that your cat’s appetite has changed. We’re not talking about a cat that habitually eats too much. “In a healthy cat, if food is available all the time, they can overeat and become overweight,” stresses Dr. Ross. You can address overeating by changing your feeding pattern, but that’s not an appetite problem. A change in appetite, on the other hand, may signal a health problem in your feline friend. Here’s how to spot a problem, when to consult your veterinarian — and common causes and treatments. “Poor appetite just means your cat is not feeling well,” says Dr. Ross. “One could write a book about the number of diseases that cause a cat to not feel well and stop eating.” If you suspect that your cat’s appetite has flagged, and you have several cats, you may want to separate them into different rooms, in order to see how much each one is eating. A more telling sign: weight loss. “You can evaluate that by feeling your cat,” explains Dr. Ross. “Does your cat feel thinner?” If you have a bathroom scale, you can also pick up your cat, weigh both of you, and then put your cat down, and note the difference. If your cat feels thinner or weighs less, it’s time to call the veterinarian. If the cause is a fever or bite —once the acute situation is resolved, your cat’s appetite should return quickly. But when chronic conditions such as liver or kidney disease cause a persistent appetite problem, “nutrition is important,” says Dr. Ross. Work with your vet to get your cat on the right diet. “For kidney disease, the goal may be to feed a low protein diet,” she says. 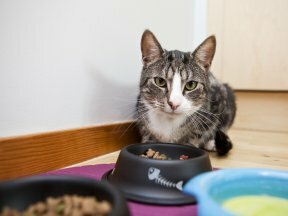 “But in general, we would rather the cat eat something rather than nothing, even if it’s the ‘wrong’ thing.” You can also try new ways to entice your cat to eat, and in some cases, your veterinarian may prescribe appetite stimulants or feeding tubes (see related sidebar on this page). If your cat’s appetite or weight is flagging, the most important thing is to get him or her to the vet. “It’s fine to use treats, but if your cat’s appetite doesn’t return to normal, make an appointment with your veterinarian,” urges Dr. Ross. The most common causes, often seen in older cats, are hyperthyroidism (high thyroid hormones) or diabetes. Another possibility is an intestinal condition, in which food goes into the digestive track but nutrients are not absorbed properly.